Stories are how people make sense of the world, so it follows that they’d also be our way of making sense of data. As much as technology can facilitate data storytelling, it cannot (yet) perform the pivotal step of placing data into the human context. That’s our job, and we’re really good at it. We’re such natural storytellers, in fact, that most of us already use a story format for presenting information. Take the standard scientific research paper format. After the title and authors (our main cast of characters), we get a summary of the story in the article abstract. It’s like one of Shakespeare’s spoiler-laden prologues, a quick preview of what’s to come. After that comes the Introduction, complete with the scientific problem and research question that incites the story’s action, the experiment itself. The Materials and Methods sections chronicle the heros’ journey as they conduct the experiment, and the Results and Discussion sections are when we find out how they fared. Beginning, middle, end. Rising action, falling action, resolution. Story! Try to convey one idea. Explore a topic you know well. So let’s walk through the process of composing a data story starting with the data itself. The function of data in a data story is to tell what happened, and figuring out what happened typically starts with a question. Typical business-oriented questions usually revolve around sales or other KPIs, but they could be about anything—the results of a customer satisfaction survey, the efficacy of a policy change, the user behavior on a website. Once the overall question is established (e.g., How are our sales doing this quarter compared to last quarter? ), you can begin to partition the data into smaller, more manageable pieces. Maybe you can track sales by product or by sales representative or by company branch. Maybe you can look for correlations between revenue and other variables. His explorations showed that that residents of New Jersey mostly get ticketed in lower Manhattan while residents of California mostly get ticketed in Brooklyn, suggesting something about the cultural proclivities of each group. 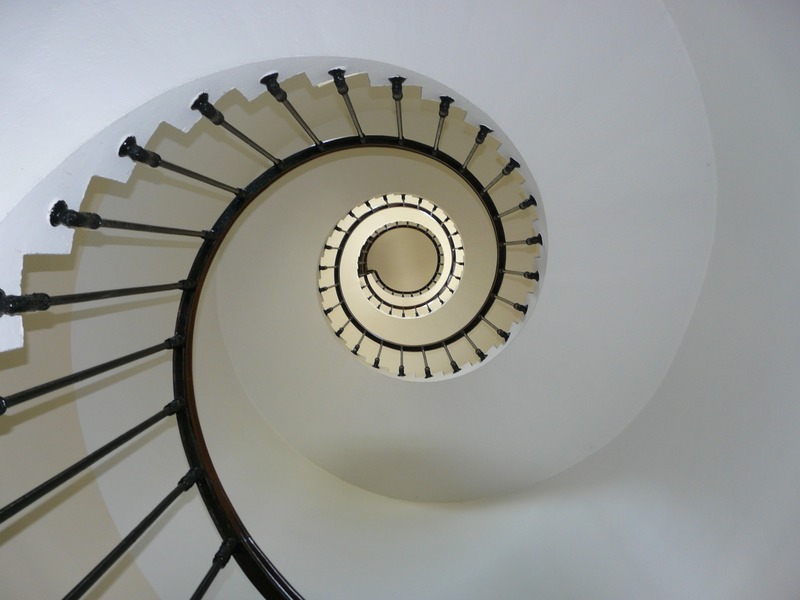 Once you’ve found an interesting pattern, the next step in familiarizing yourself with the data is to ask why. Why do Californians get ticketed in Brooklyn more than in Manhattan? Perhaps there are other metrics to help explain the trend. Ultimately, your goal in gathering and analyzing the data is to evaluate it. Are the trends favorable or unfavorable? 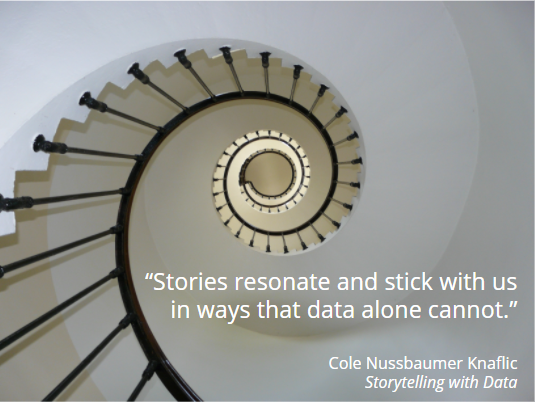 What action do you hope to incite with your data story? The evaluation is why you’re going to the trouble of crafting a data story rather than a straightforward report. Ben Wellington noticed that the NYPD was systematically ticketing legally parked cars and wanted authorities to put a stop to it. Without a purpose, your story will fail to connect with the audience, so work with your data until you have a clear narrative direction. Your visuals should be clear and memorable, but memorable doesn’t have to mean gimmicky. All of these methods help build an emotional connection between the audience and the data by representing figures in more relatable terms. Changing the scale of the data or introducing a familiar object as a point of reference can go a long way towards driving your message home and helping it stick. Familiarity with the subject matter. How much your audience can be expected to know already will dictate how much detail you include in your story. Expectations. What information does the audience expect to leave with? Understanding audience expectations will help ensure that you cover all necessary topics, but it can also help you plan surprises like plot twists or meta moments. Valuable departures from the expected can give your story more impact. Roles. People can have multiple roles at once. A woman can be a mother and a CTO as well as a community activist and a developer. Roles are especially helpful to consider as you try to connect with audience members on an emotional level. Understanding your audience will help you speak to that audience in a more meaningful way, but it’s also important to make sure your narrative has all the necessary components. By convention, a narrative typically has a protagonist (good guy), antagonist (bad guy), inciting action (catalyst for change), conflict (problem), and resolution (solution or outcome). In business contexts, Team Good Guys is usually the company whose progress is being reported, and the bad guys are either competitors, market forces, or other impediments to growth. But there can be minor characters as well: business partners, collaborators, team members, and you! Yes, you can also insert personal stories into the narrative, work-related or not. Perhaps you have an anecdote that illustrates a relevant theme or concept, or maybe a pivotal moment in the overall narrative happened to coincide with a personal event. Don’t forget to describe your characters (even if they are businesses) to audience members not yet familiar with them. Next comes the inciting action. For Ben Wellington, I Quant NY was incited by the genesis of NYC Open Data. 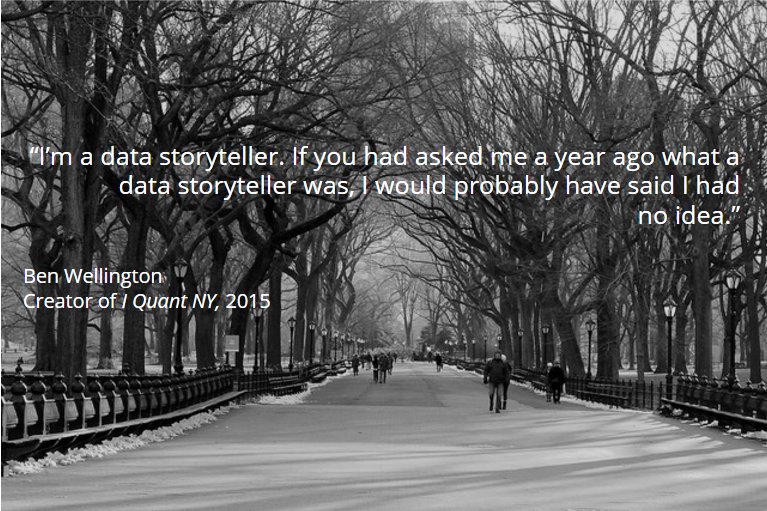 Without that catalyst, he may never have discovered his love of data storytelling. In business contexts, the inciting action might be a performance goal or revenue target. In such cases, it helps invest the audience in the story if you can explain why those targets are important to the company’s (protagonist’s) survival. This raises the stakes and helps retain the audience’s attention. Note, also, that more complex plots may have multiple inciting actions, depending on how many times the protagonist is motivated to “make a move” or advance the story. Finally, conflict and resolution. This is often where your data comes in. The protagonist takes some sort of action to address the conflict between it and its antagonist, and the data illustrates how successful they were. When there are multiple campaigns designed to resolve the conflict and multiple ways of looking at each campaign, there can be a lot of data to review. In these cases, focus only on the visualizations that are essential to the narrative, or the story will dissolve into a humdrum boardroom presentation. As you present your audience with the story’s resolution, think back to your initial evaluation of the data: good or bad? Comedy or tragedy? Make sure your call to action fits the story and furthers its purpose. My name is Anne, you guys. And I was just out walking around the airplane, and they're throwing the last of your—I mean, um, I'm sorry about that. I didn't mean to say throwing. I used to work over at American, you know. Old habits die hard. So what I meant to say was, they were lovingly and gently placing your bags in the lower belly, and then we'll be pushing back from the gate on time. She goes on to relate the usual data—target airspeed and altitude, projected arrival time, etc.—but with a flair that puts her harried travelers at ease and makes the flight a more memorable experience. What could you do with that kind of fire power behind your next presentation? Photo Credits: These modified versions of "Central Park" by Alejandro Rdguez and "Black Circular Staircase" are licensed under CC BY 2.0, as is this post's thumnail image, a modification of "The heat map of my @foursquare checkins from Where Do I Go. This is pretty amazing" by dennis crowley.